Burguk's Longhouse is the longhouse of Chief Burguk, located in the Orc stronghold of Dushnikh Yal. It is located in The Reach, Southeast of Markarth, southwest of Karthspire. It contains two zones; Burguk's Longhouse and Burguk's Longhouse Cellar. 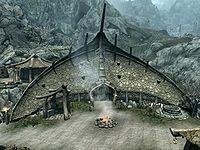 It seems to be the most prosperous stronghold in Skyrim, due to the quality of the items in the longhouse. The entrance is normally novice locked, however if you have received Ghorbash the Iron Hand's key to the longhouse, you will be able to enter without it being considered trespassing. Upon entry there is a dresser to your right holding a copy of The Code of Malacath, with a fire pit against the west wall opposite the entrance. There is a searchable pot hanging over it. To the right, against the north wall is a sideboard with a leg of goat, three leeks, a cabbage, a rabbit and an iron dagger on top and a metal pot concealing a random ingredient underneath. Hanging above the sideboard are two racks holding two rabbits and a pheasant. between the sideboard and fire pit is a trapdoor to the cellar. To the left of the fire pit, still against the west wall is a very long wooden table set with fancy plates, goblet, a jug and platter along with four portions of grilled leeks, two legs of goat roast, a baked potato and a couple of goat cheese wedges. In the southwest corner is a square wooden table holding a flute. To the left of the entrance as you enter are a couple of sets of shelves holding a whole range of fancy cookware include bowls, plates, goblets, jugs and candlesticks as well as two red and green apples and two cabbages. There are doorways into bedrooms to the southeast and northeast. The doorway to the southeast leads to Chief Burguk's bedroom and contains a double bed coming out from the east wall with a weapon plaque over it holding a leveled battleaxe, an end table to the left of the bed, a chair to the right and an unlocked respawning chest containing random items at the foot of the bed. To the left, against the wall is a wooden bench and to the left a dresser with an iron dagger, a medium coin purse and a copy of The Bear of Markarth on top. To the right of the bed is a set of shelves holding a set of iron armor, an iron helmet and a couple of ruined books. To the right of the doorway as you enter the bedroom is another dresser, this one holding a pair of leveled gauntlets, a fancy platter, jug and bowl. The bedroom to the northeast is very cluttered and contains six single beds. In the southwest corner is a set of shelves holding seven common books and a couple of sacks of foodstuffs, with an end table against the west wall beside it, next along are two of the single beds coming out from the wall, but they have been pushed together, with a dresser holding two more common books on the other side of them. There is another bed coming out from the wall next to the dresser, with an unlocked chest containing leveled items at the foot of the bed and a final bed along the wall, not coming out from it, with a pair of hide boots beside it. On the other side of the room, starting with a bed along the east wall with an end table with a small coin purse on top at the foot of the bed. Next to this is a bed coming out from the wall with a pair of leather boots beside it. At the end of the room is a doorway into a tiny bedroom containing a single bed against the northwest wall, a round wooden table at the foot of the bed, right in the northern corner, with two common books and a copy of The True Nature of Orcs on top and more food sacks on the floor. Opposite the bed against the east wall is a dresser containing clothes with a respawning apothecary's satchel containing common ingredients, a potion of minor stamina and a leveled healing potion and a copy of Lost Legends all on top. The same key that opens the longhouse also open the trapdoor to the cellar. When entering the cellar you descend the ladder to find a stack of crates and a couple of food barrels beside it. You are on a raised wooden platform with a couple of sets of shelves and cupboards around a round wooden table and two chairs in the middle of the platform. The shelves hold a bottle of wine, two bottles of Nord mead, an iron dagger and a couple of wheels of cheese. While one of the cupboards hold only clutter, the other holds two bottles of alto wine, two bottles of wine and a few potatoes. To the right of this one are two more chairs and to the right is a dresser holding a mixture of clothes and fine clothes with an iron dagger laying on top. To the northwest there is a ramp down off the platform to a cave area with a variety of different fungi including bleeding crown, blisterwort and imp stool all growing together next to a rock pillar at the bottom of the ramp, elsewhere in the cellar are white cap and Namira's rot fungi. Next to the ramp is a sideboard holding an iron war axe, a leveled sword and copies of two common books and a copy of the Heavy Armor skill book Orsinium and the Orcs. There is also an iron shield leaning against the sideboard on the ground. Under the platform is an apprentice locked respawning chest containing random items and further back there is a cupboard with a leveled healing potion and a potion of minor healing, a potion of minor magicka and potion of minor stamina as well as a leveled helmet and the unique dragonfly in a jar, one of the five bugs in a jar. There are a pair of iron boots and an iron warhammer in front and leaning against the cupboard. There is a path that continues to the north before twisting and turning until you reach another room which contains a few food barrels, one of which has a pile of potatoes on top, a total of six racks hanging from the ceiling in two groups of three, holding two pheasants and four rabbits. Next to a frame for stretching pelts is a medium coin purse on the ground. The path leaves this room to the northwest and takes you to a room with an alchemy lab with a potion of minor healing and a potion of minor magicka on top and various ingredients laying on rocks and hanging from the ceiling all around. There is a bunch of jazbay grapes, a total of seven garlic bulbs and braids, two bowls of bone meal, a total of eight bunches of dried elves ear, a bunch of frost mirriam, a sprig of snowberries, two bunches of juniper berries, a taproot and a bunch of lavender. There is also a respawning apothecary's satchel containing uncommon ingredients on one of the rocks. The path continues to the west, passing under a naturally lit section before rejoining where you started, opposite the sideboard. The path also has several varieties of fungi growing in them. The main building respawns but the cellar does not. A permanently disabled copy of the unobtainable item Ghorbash's Ancestral Axe is located in the cell. Other than most barrels, sacks, and containers specified to be respawning above, all containers in the house are non-respawning and safe to store items in. This page was last modified on 7 January 2018, at 00:14.